Visiting a National Trust property usually involves pulling on your wellies for a bracing walk or tiptoeing round the grand salons of a stately home. 575 Wandsworth Road is very different. The Wandsworth Road is not a place redolent of gracious living or the great outdoors, it is a nondescript thoroughfare lined with tower blocks interspersed with some Georgian terraced houses. On a grey day when the sun failed to show its face it seems the most unlikely place to find a National Trust property and indeed we walked straight past the unsigned and nondescript frontage. What lies behind the plain front door is far from nondescript. Everywhere you look is festooned with fine wooden fret work. 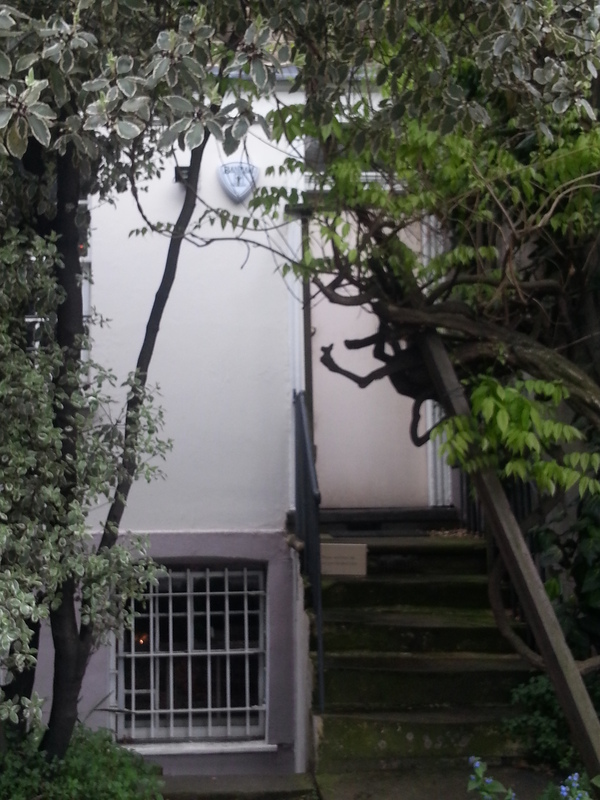 575 Wandsworth Road was the home of Khadambi Asalache; poet, novelist and Treasury Civil servant for nearly 30 years. One day he saw a clutch of pine floor boards in a skip and thought that they would be just the thing to cover up a patch of persistent damp in his basement dining room. Once they were installed he found the vertical joins of the boards unsightly and decided to disguise them with fret work. 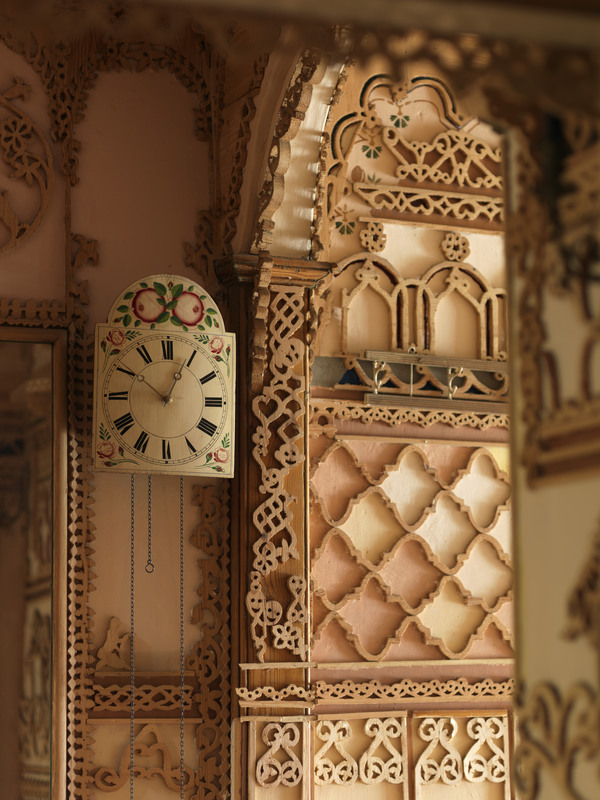 He so liked the effect that, over a period of 20 years, he went on to embellish almost every surface in the house with beautifully carved patterns and motifs. 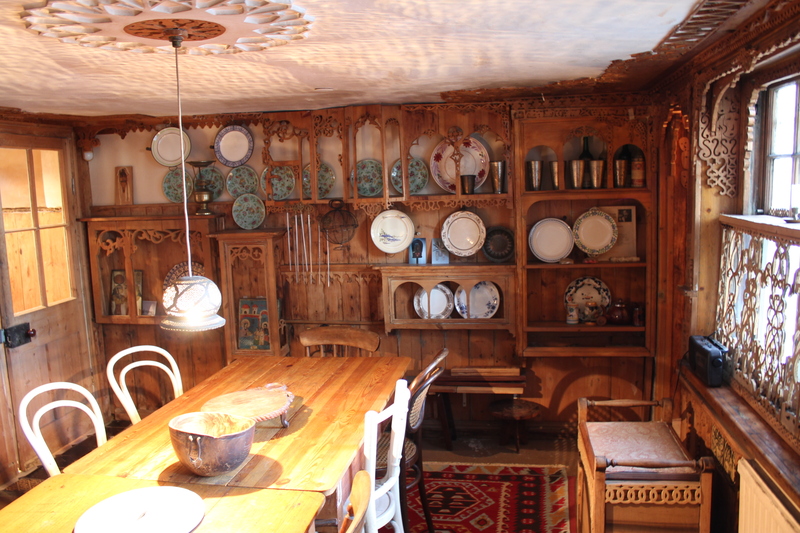 In addition to festooning his house with carving, Mr Asalache also collected many things. He had a special fondness for lustreware and pressed glass ink wells, examples of which are displayed in the many niches around the house. The floors and walls of the upper two floors of the house have also been painted, one of the bedrooms has scenes from the river Nile all the way from source to Alexandria. Khadambi Asalache left the house to the National Trust on his death. The Trust has spent many years and pounds fixing the considerable damp problem and now the house looks just as it did when Mr Asalache lived their right down to the toothpaste in the bath room and contents of the kitchen cupboards. It is a house in which you can easily imagine attending one of his many convivial dinner parties. 575 Wandsworth Road is very small and its interior is extremely fragile so numbers are limited to 10 visitors at any one time. All tours need to be booked in advance by either ringing 0844 249 1985 or via the website . Outside shoes are not allowed in the house, either bring your own slippers, pad a round in yours ur socks or hire a pair of slipper socks for £2. London has a wealth of small house museums. One’s that I have particularly enjoyed include Strawberry Hill House, The Benjamin Franklin House, Turner’s House, the John Soane Museum, Pitzhanger Manor, the Emery Walker House and 18 Stafford Terrace. I went on a girls outing, you would need exceptionally still children!